Top secret documents from Edward Snowden’s cache have revealed Canada’s ambition to become a big player in the world of electronic spying. The leak comes just as the country plans to vote on a law that would give its cyber agencies more powers. The C-51 bill, which would relax Canada’s stringent policing and intelligence regulations, is currently being pushed through parliament by the ruling Conservative party in the cause of combatting terrorism, but is facing spirited resistance, including filibusters from the opposition. Public demonstrations have also been staged against the legislation, which has been criticized as vague, shadowy and intrusive. – ‘Traffic Alteration’: intercepting enemy communications with the purpose of inserting malware, which can be used for inflicting damage. “In moving from ideas or concepts to planning and implementation, we examine proposals closely to ensure that they comply with the law and internal policies, and that they ultimately lead to effective and efficient ways to protect Canada and Canadians against threats,” CSE said in a statement. Former NSA contractor and CIA employee Snowden distributed part of the classified documents exposing relentless mass surveillance by the US and its key allies to Canadian media. 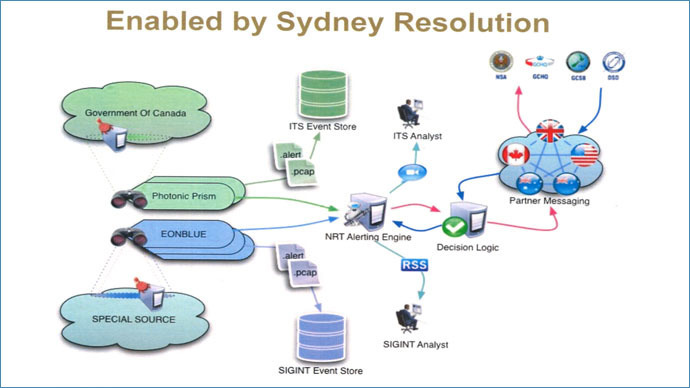 Previously leaked materials have already revealed that the CSE shares some of its tactics with the NSA and even allegedly uses the US agency’s cyber warfare software for some tasks. Snowden’s leaks had shown that the CSE targets cellphones with the highly sophisticated WARRIORPRIDE malware and also maintains a botnet, or a whole network of infected private computers, to attack targets without giving itself away. Back in 2013, the NSA leaks implied that Canadians were also allegedly involved in spying on devices connected to the Brazilian mining and energy ministry – which was part of what prompted accusations of industrial espionage and a diplomatic row between Brasilia and Washington.